The filling in this chocolate pecan pie recipe gets a little extra kick from a shot of rum. The result is a rich, chocolatey, and boozy dessert, with plenty of crunch from the pecans. When Ben and I got married three years ago in 2015, the date was actually 3/14/15. I referred to this as “Super Pi Day” throughout our engagement, since the next two digits of Pi are 1 and 5 (where are my math nerds at??). Given the extra special occasion, we obviously couldn’t pass up the opportunity to serve pie for all the guests at our wedding! And each anniversary, we love to celebrate together with pie. This year, I decided to recreate one of the pies that Sweety Pies Bakery catered for our reception. Out of all the flavors, the chocolate pecan pie with rum was our favorite. They called it “crocodile pie” and I thought it would be the perfect recipe to share with you in preparation for whatever Pi Day celebrations you might have coming up next week. To develop this recipe, I started with all the ingredients of a classic pecan pie filling, drizzled in some melted chocolate, and then made it a little boozy by adding a shot of rum. I love the look of pecans arranged in concentric circles on a pecan pie, so I added them to the filling, as well as on top. It gives this chocolate pecan pie a good amount of crunch! I find a pair of culinary tweezers to be really helpful in placing the pecans and if need be, adjusting their position after the fact. They aren’t necessary, just helpful if you want to be very precise! I use these tweezers often when decorating my layer cakes as well. I find that my pecan pies tend to puff up a bit in the center while in the oven. No need to panic if this happens, the filling will flatten and settle as it cools and you’ll end up with a totally gorgeous pie. And it tastes as good as it looks! With all the chocolate, pecans, and rum in the filling, this pie is rich, crunchy, and boozy all at the same time. You can ben Ben and I will be celebrating three years together with this pie next week. Don’t forget to share a photo and tag @flourcoveredapron if you make it too! 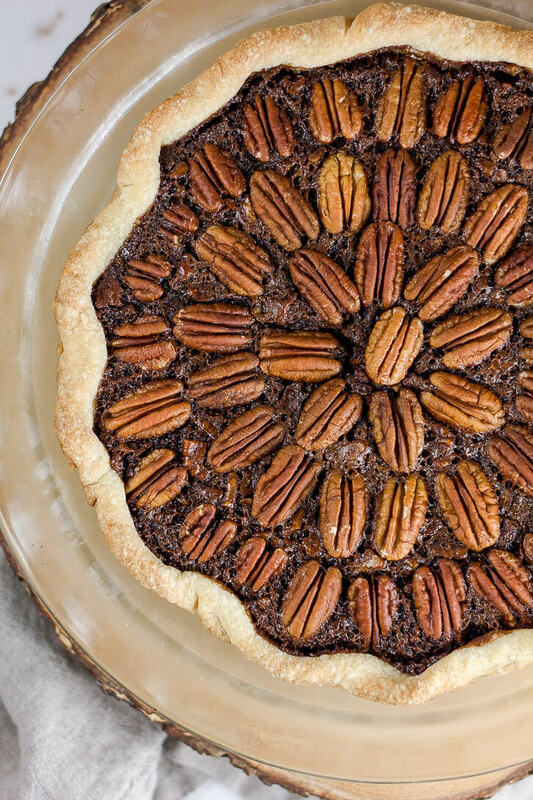 The filling in this chocolate pecan pie gets a little extra kick from a shot of rum. The result is a perfectly rich and chocolatey dessert, filled with crunchy pecans. In a medium-size bowl, whisk together flour, sugar, and salt with a fork. Add butter and use a pastry blender (or two forks) to cut the butter into the flour mixture until incorporated and crumbles are no larger than small peas. Add buttermilk 1 tablespoon at a time, mixing with a fork until the dough becomes moistened and shaggy and starts to come together. Don't add more buttermilk than you need to. Use your hands to knead the dough and form into a ball. Flatten it slightly into a disc, wrap in saran wrap, then chill for at least an hour. Once chilled, turn the dough out onto a lightly floured surface and use a rolling pin to roll it out into a circle 12 inches in diameter. Transfer the dough to a 9-inch pie plate, trim off the excess, tuck the edges under, then flute the edges. Put the crust back in the fridge while you make the filling. Preheat the oven to 350 degrees Fahrenheit. In a small saucepan over low heat, melt the chocolate and butter together, stirring frequently. Let cool slightly. In a large bowl, whisk together the eggs, brown sugar, corn syrup, vanilla, rum, and salt. Whisk in the chocolate mixture until smooth. Fold in the 1 1/2 cups chopped pecans. Pour filling into the prepared pie crust, then arrange the pecan halves on top in concentric circles. Bake the pie for 40-45 minutes. I recommend tenting a piece of foil over the pie halfway through, then removing it for the last 5 minutes or so to prevent over-browning. Pie may rise up in the middle while baking and will still be slightly jiggly in the center when done - this is okay, it will flatten and set as it cools. Place on a wire rack to cool completely. Cover leftovers tightly with foil and store in the refrigerator. What a fun day to get married! Chocolate and pecans (and spirits) are one of my favorite combinations. This pie looks so delicious! Thank you, Leona. 🙂 Chocolate and pecans really are wonderful together!